We have recently carried out a number of small jobs for Rochford District Council. One of these of particular interest was the external redecoration of the Old House in South Street. 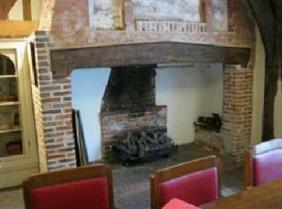 This is a Grade 1 listed building and is of great historical value to the local area. The main central hall is the oldest part of the house and it is well over 700 years old, having been built circa. 1290. The house has seen only a few major changes in its entire history and it is a wonderful example of building methods in the middle-ages. The original construction included a fire pit in the centre of the main central hall; the smoke and fumes from the fire escaped through an opening in the ridge of the roof. The fire pit and the charred roof timbers where the smoke escaped still remain in their original condition to this day. In approximately 1550, the chimney stack was inserted to replace the open fire pit. During the Tudor period, chimney stacks were a mark of status; this one shows a very high standing for the occupants of the house at the time of its building. The Georgian bay windows at the front of the building were installed during the mid 1700’s.